Usually I don’t travel much during Qingming Festival. But this was different. 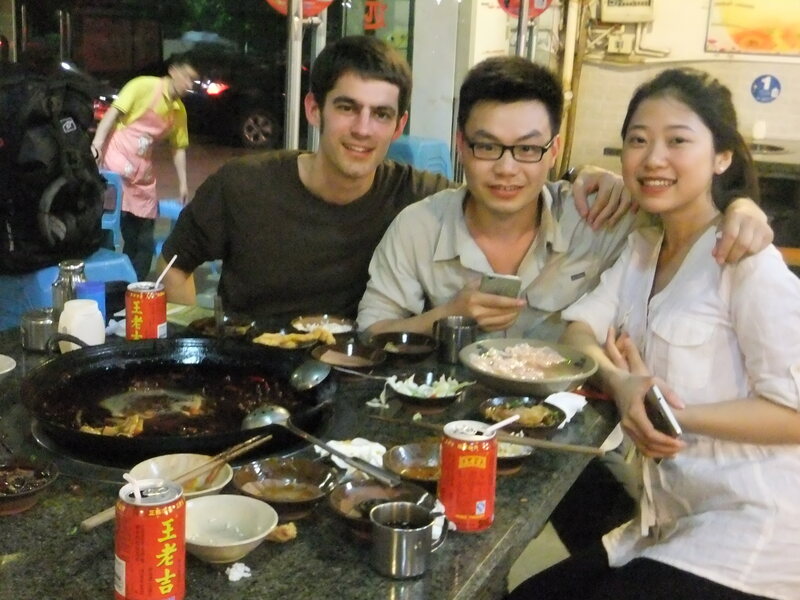 My Chinese friend, Jackman, would be leaving for Malaysia in a few days, and since this would probably be my last chance to see him, I decided to visit him in Chongqing, a city known for spicy food and beautiful women. After I met Jackman and his friend, Melody, at the airport, we went to a hotpot restaurant for some traditional Chongqing cuisine. The waiter placed a large metal pot on the table filled with red peppers and Sichuan peppers floating in a dark red, oily broth. We hadn’t even started eating, and I was slightly unnerved. We ordered duck innards, pork intestine, pork, fish, and tofu. As I began eating the food, the heat slowly intensified. First, my tongue became inflamed, then I began sweating, and soon my whole mouth was numb and quivering. Later, the fire traveled to my stomach. Not a good sign. When I got back to the hotel with Jackman, we had the unfortunate choice of booking a room close to a new subway line being constructed through the night. Besides the construction, a dog was barking incessantly, and the fire in my stomach was looking for an exit. Needless to say, it was a long night. The next day I woke up to the sound of jackhammers. Not my preference for an alarm clock, but certainly effective. After a noodle breakfast, Jackman and I met Melody and visited Ciqikou, a historic section of Chongqing with buildings several hundred years old. Most were wooden structures with traditional Chinese tiling. We walked along its maze of alleys past many cafes and little shops selling flowers, jewelry, and other trinkets. A few elderly people still live in the village, but most of the houses will be torn down soon. The past will soon only be a lingering memory here. After lunch, we went to a museum at the foot of Gele Mountain, which chronicled the Kuomintang’s imprisonment of Communist Party members. Apparently, you could visit the prisons and examine the torture devices the captors used on their prisoners. I opted out of that experience. Instead, we climbed the 800m-high mountain with 1,957 steps. Apparently, the man who financed the construction of the steps was born that year. The climb wasn’t too tiring, but my stomach still hadn’t forgiven me for eating Sichuan hotpot. So I had to do some trailblazing and find a secluded spot to relieve myself (I hoped for the last time). After descending the mountain, we went downtown for some Chongqing snacks where I ate a spicy noodle bowl with pieces of pork and vegetables and also some skewers of algae, tofu, and lotus root. Chongqing people are avid snackers. They love to snack, whenever possible, wherever possible. I think I could happily embrace such a lifestyle. After dinner, we went to the cable car terminal that transported passengers from one side of the Yangtze River to the other. After nearly an hour, we entered the waiting area and watched the cable car slowly enter the terminal. Once its sliding doors opened, there was a frantic, mad rush into the car. Somehow I managed to get a window view. The river moved along placidly as the city lights twinkled off its surface. The ride ended after a few minutes. We had hoped to take a boat cruise that night, but unfortunately, only the expensive rides were left. So we visited Hongyadong instead, an 11-story cultural building with food courts, theaters, cafes, and tea shops. One guy was mashing up rice in a wooden bucket with a long wooden pole. I tried helping him out. Not sure which got mashed more, my hands or the rice. Eventually we found a tea shop on the top floor. There were some open-air seats that presented an expansive view of the river and the city behind it. I sipped some strawberry pomelo black tea and chatted with Melody as we gazed at the serene view before us. A cool breeze blew gently on my face. This was Chongqing at its best. Tomorrow Jackman and I would leave the city and visit his hometown, a farming village called Dazu (Big Foot).